Prosecutors are expected to indict former Supreme Court Chief Justice Yang Sung-tae later this week on charges that he abused his power to influence high-profile trials as a political tool to lobby the previous government. Yang, 71, is under pre-indictment detention upon a court approval of his arrest warrant on Jan. 24. He's the first former chief of South Korea's top court to have been arrested as a suspect and now to face a criminal trial. The retired veteran justice with a law career over 40 years is accused of using or seeking to use trials as leverage to lobby the office of then President Park Geun-hye to get her approval for the establishment of a separate court of appeals, his pet project. Yang headed the top court from 2011-2017. 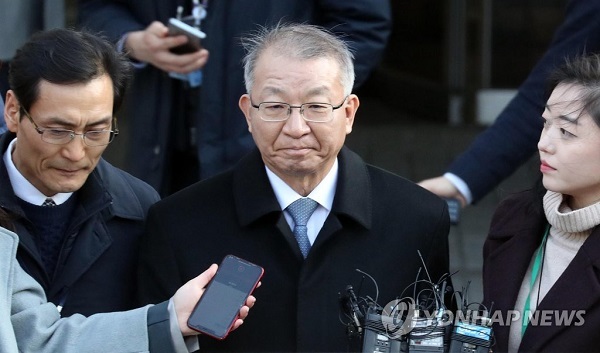 The Seoul Central District Court ruled that his charges were proven and that he posed a risk of destroying evidence.Prosecutors are widely expected to formally indict Yang later this week, right after the Lunar New Year holiday, which ends Wednesday. "We're focusing to be fully prepared for the indictment, and there's a good chance that we bring the indictment by after the holiday, although we don't have a fixed deadline," a prosecution official said earlier. Prosecutors have until Feb. 12 to charge Yang while having him in detention. An arrest warrant allows them to detain a suspect for up to 10 days before pressing charges and is extendable by another 10-day period. They are also likely to indict two retired justices -- Park Byong-dae and Ko Young-han -- for their alleged involvement in the case. The court has denied the arrest warrants for the two, citing a lack of grounds for detention. Prosecutors accuse Yang of having instructed officials at the National Court Administration (NCA), the top court's governing body, to devise ways to interfere in trials whose rulings potentially held high political significance for Park.